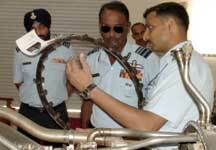 Chandigarh : July 17, 2008:Air Marshal PK Barbora, Air Officer Commanding–in–Chief (AOC-in-C), Western Air Command (WAC), Indian Air Force visited Air Force Station High grounds near here today. On his arrival at the station, Group Captain RKS Shera and his wife Mrs Jaspreet Shera welcomed the Air Marshal and his wife Mrs Arundhati Barbora, Regional President AFWWA (Air Force Wives Welfare Association). During the visit, the Air Marshal was briefed about the training being conducted for IAF pilots and the maintenance staff at High Grounds. The AOC-in-C was also briefed on various innovations and training aids developed in house by the training school. The school also conducts training for pilots and technicians of friendly foreign countries. Later, Air Marshal Barbora visited the MiG 29 and MiG 27 Training Complex and urged the instructors to strive for excellence. He also interacted with the personnel of the station and motivated them to work towards the organizational goal. He appreciated the positive changes in the work culture of the station. Mrs Barbora visited the AFWWA ventures at the station. Interacting with ladies of the station, Mrs Barbora called upon them to voluntarily participate in AFWWA activities while Mrs Shera briefed her about the various welfare activities being undertaken at the station by AFWWA. Mrs Barbora also visited the Air Force School where she met the children and emphasised upon the activity based learning process.